Udupi, Jan 16 2018; The the 249th Paryaya - the biennial transfer of power among heads of Udupi ashta mutts- is all set to dawn on January 18. The event confers the rights of worshipping the presiding deity of Sri Krishna Temple on the seer ascending the Sarvajna Peeta. Vidyadeesha Tirtha swami, seer of Palimaru mutt, will take over this responsibility for the second time from Vishwesha Tirtha, seer of Pejawar mutt. With the temple town bedecked for this religious event, seer Vidyadeesha has arranged a public felicitation to Sri Visvesha Tirtha swami and his junior disciple Vishwaprasanna Tirtha at the Sripara Vidya Mantap on Jan 18, Wednesday. D Veerendra Heggade, dharmadhikari, Dharmasthala, Pramod Madhwaraj, district minister, Shobha Karandlaje, MP, P G R Sindhia, former minister, Raghupathy Bhat, former MLA, Dr M Mohan Alva, educationist, and others will attend. The paryaya procession of all the Ashta Mutt seers will get underway at Jodukatte at 3am on January 18 with Vidyadeesha swami carrying his home deity in the palanquin and heads of other mutts in attendance. The procession with more than 15 tableaux and more than 60 folk, bhajan and cultural troupes will reach Ratha Beedhi via Kavi Mudanna Marg, said Balaji Raghavendra Acharya, working president, Palimaru Paryaya Reception Committee. Vidyadeesha Tirtha will ascend Sarvajna Peeta at 6.35am on Thursday. This will be followed by traditional Paryaya darbar at the Rajangana. Both new and incumbent Paryaya seers will be felicitated on this occasion. The committee will also honour Veerendra Heggade at the darbar. Post-darbar, Vidyadeesha Tirtha will start his Paryaya tenure with Laksha Tulasi archane of Lord Krishna. As pledged by Vidyadeesha Tirtha, two-year akhanda bhajan programme too will get underway. The continuous Jnanayajna by Bhandarkeri Mutt head will be inaugurated at the Rajangana at 4pm. Ananth Kumar Hegde, union minister, Sindhia and other guests will be part of the special programme at 5pm. Special cultural programmes will be held every evening from January 18 to 29 at the Rajangana from 7pm. Zero traffic: The district administration will ensure zero traffic on the adjacent road along the procession route to enable devotees view the procession in its full splendour. Felicitation: K Vasudeva Asranna, Dr Mohan Alva, Neramballi Raghavendra Rao, Mayura Srinivas Rao, K Nagaraj Puranik, Adka Raghavendra Rao, Magsaysay awardee Rajendra Singh, Madhu Pandit Das of ISKCON, Kishore Alva of Adani group, K Rama Prasad Bhat from Chennai, Annappa Hegde, Gopal Mogeraya, NRI-industrialist B R Shetty will be felicitated at the Paryaya Darbar. DK, Kasaragod sends horekanike dibbanna to Udupi paryaya : The coastal districts of Dakshina Kannada and Kasaragod came up with their own contribution for the second paryaya of Sri Vidyadeesha Tirtha, seer of Palimar Mutt, by taking out horekanike dibanna on Monday. The procession started from Sharavu Sri Mahaganapathy Temple under the stewardship of S Pradeep Kumar Kalkura, working president of Paryaya reception committee in the presence of community leaders A J Shetty, M B Puranik and others. Choornotsava celebrated : As part of ‘Saptotsava’, the annual seven days car festival, the daylight ‘Bramharathotsava’ of Lord Sri Krishna, popularly known as ‘Choornotsava’, was held on Monday as part of the final day celebrations at Sri Krishna Temple in Udupi, with great religious zeal and splendour. The daylight car festival was held under the guidance of Paryaya Pejawar Mutt senior and junior seers Sri Vishvesha Theertha Swami and Sri Vishwaprasanna Theertha Swami. All the six-day Rathotsavas were held during the night. Seers Vidyasagara Theertha Swami of Krishnapur Mutt, Kshatriya Theertha Swami of Adamar Mutt, Vidhyadeesha Theertha Swami of Palimaru Mutt, Vidhyavallabha Theertha Swami of Kaniyur mutt, Vishwavallabha Theertha Swami of Sode Vadiraj Mutt and Shubudhendra Theertha Swamiji of Mantralaya were present and participated in the car festival in which a large number of devotees also took part. A specially made clay idol of Lord Krishna was mounted on ‘Bramharatha’, a huge chariot for daylight car festival. 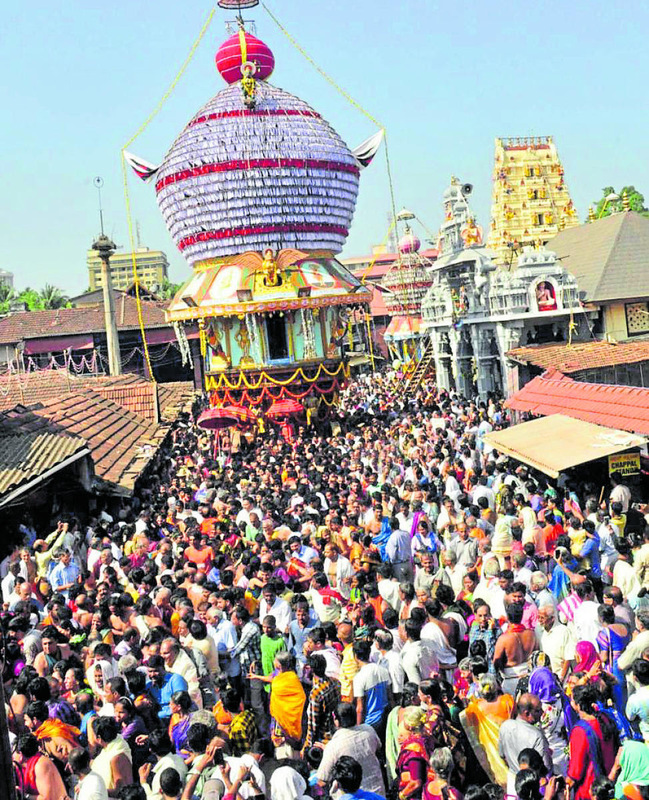 A large number of devotees pulled the chariot around the Car Street. After performing ‘Mahamangalarathi’ to the ‘Utsavamurthy’ of the presiding deity Lord Sri Krishna, sweets, coconuts, fruits and coins were thrown at the devotees, by the participating Swamis, from Bramharatha. Choornotsava is being held annually to commemorate the installation of Saligramashila idol of Lord Sri Krishna in the child form with a churning rod on one hand and rope on the other hand. The idol was installed by great saint and philosopher Sri Madhwacharya more than 800 years ago. It is said that the Saligramashila idols of Lord Sri Krishna and Lord Balaram covered with “Gopichandana mud” were presented to Sri Madhwacharya by a sailor whose ship was rescued from a wreck on the Arabian Sea, by the saint. The idol of Lord Balaram was installed at Vadabhandeshwara, near Malpe beach, about five- km from here by the saint while idol of Lord Krishna was installed in Udupi on the Makara Sankranti day. After the Rathotsava, the clay idol was immersed in the temple pond ‘Madhwa Sarovara’ followed by a holy dip by the assembled seers and devotees. The presiding deity inside the sanctum sanctorum was specially decorated for the occasion. Mass feeding was also held later in the temple. 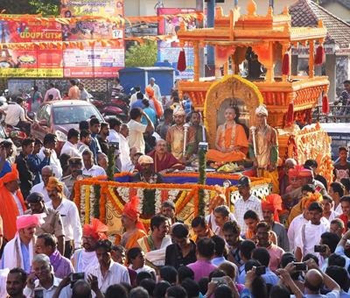 During the car festival, the idol of Lord Krishna was taken in the Bramharatha, while Lord Hanuman (Mukhyaprana) was taken in a medium Ratha and idols of Lord Anantheshwar and Sri Chandramouleeshwar, the presiding deities of the oldest temples of Udupi, were taken in a small chariot.